Despite its apparent heyday being far behind us, there does seem to be a healthy number of modern first-person dungeon crawlers around. Surprisingly, many of them are handheld games, but on PC we’ve not been left out in the cold. Legend of Grimrock and Might & Magic X are the most notable ones, but there’s StarCrawlers, too, and it looks rather promising. And the dungeons are spaceships rather than crumbling ruins and dark caves, which is definitely a welcome shift. Perhaps it’s all the bits and bops, blinking lights and glowing panels that make spaceships a bit more interesting than gloomy dungeons. There are many bits and bobs in the corridors of StarCrawlers. And angry robots. Lots of them, apparently. I do like a good angry robot. Pleasant ones aren’t to be trusted. How very Event Horizon, and countless other sci-fi ghost ship yarns. Nothing wrong with that, mind you. It’s not all set on one ship, though, or even lots of ships. 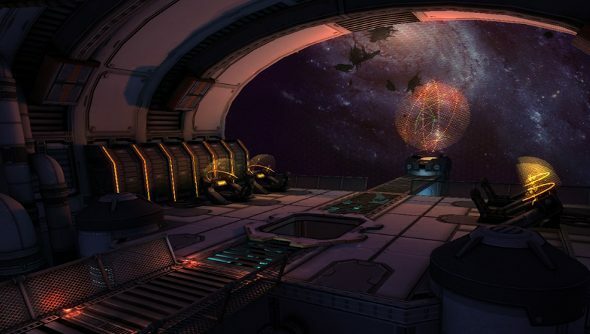 StarCrawlers boasts a rather intriguing mission system where an AI director creates missions, some which will take the adventurers to worlds as well as ships, based on past decisions and faction reputations. Lots of good stuff then. If you fancy a peek, Juggernaut Games is hoping to launch an Early Access version in November.